Leicester Cleaning Supplies are an efficient and affordable on-line retailer, for businesses, of cleaning supplies, cleaning equipment and janitorial products in the UK. Whatever your cleaning or janitorial needs, large or small, you will find everything you require within our on-line store. If however you have a requirement for something we do not appear to stock, please contact us directly on 0845 130 4598 and we will provide you with a quotation for the items. Our distribution centre is located centrally in the UK so we are able to deliver fast anywhere within the Leicester area or further afield around the UK. We have built our reputation on a fast and friendly service and high quality products. Call Leicester Cleaning Supplies now on 0845 130 4598 to find out how we are changing the way people buy cleaning and janitorial products. We supply a selection of our products by the pallet with corresponding bulk purchase pricing. 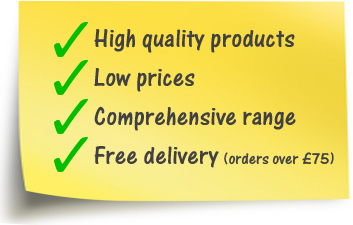 For your convenience all products supplied by the pallet are listed and can be ordered HERE. It is clearly also stated on a product page where we supply but the pallet. Additional discounts apply for orders of more than one pallet.